Get your bail money ready! 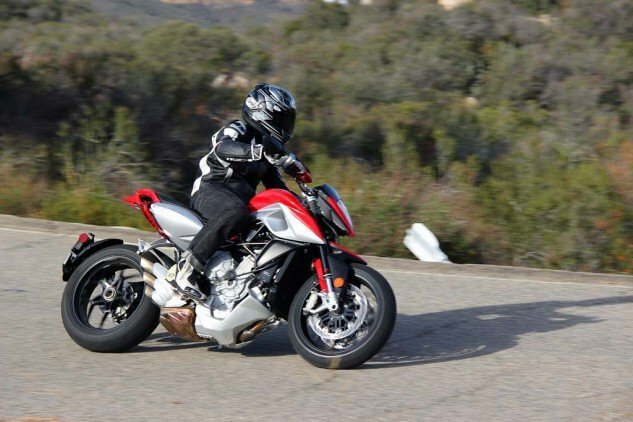 I’ve formed a love/hate relationship with the MV Agusta Rivale. In its element, which, let’s be clear, is tight and twisty ribbons of asphalt, it is an absolutely sublime machine, ready to attack a corner with precision and honk a wheelie on its way out, its three-cylinder wail filling your ear holes with pure auditory bliss. In most other environments, however, the Rivale makes me do something I rarely do on a motorcycle: look for the shortest way home. It’s not a very practical motorcycle, meaning its singular purpose is both a gift and a curse. But let’s be real for a second: nobody will be looking in the Rivale’s direction for a machine on which to do their errands. Like many MV Agustas, the Rivale is hard-edged and focused. Understand that, and it will plant a perma-smile directly on your face. Let’s examine how. Voted most beautiful motorcycle at EICMA 2012, the Rivale surely doesn’t lack in style. 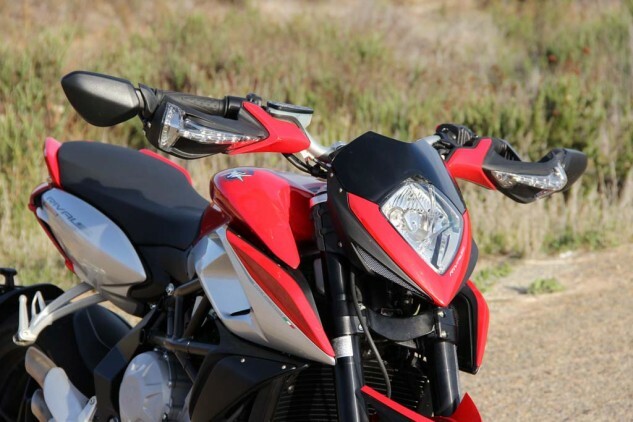 Utilizing the same 798cc inline-Triple engine seen in the Brutale 800 and F3 800 (and the upcoming Tourismo Veloce), it’s wrapped in minimal clothing. From the bare front end, to its slim mid-section, upright bars, and nicely sculpted tail, the Rivale is simply stunning. Roads like this are where the MV Agusta Rivale really feels at home. Throwing a leg over the Rivale isn’t easy for my 5-foot, 8-inch frame, as the seat is perched 34.7 inches above the tarmac. This is thanks to the Marzocchi 43mm fork and Sachs shock. Both are fully adjustable and have plenty of travel: 5.9 inches in front, 5.1 inches out back (compared to the 4.9 inches at both ends for the Brutale 800). Yep, the seat is up there, but it’s narrow, meaning my toes can touch the ground with relative ease. Thumb the starter and that lovely tre pistoni engine comes to life. It sounds great, as three cylinders often do, but this one doesn’t like staying cold for long, as it chokes and coughs until fully warm. Makes sense, considering its hot-blooded personality. But once warm, however, the Rivale comes into its own. Click it into gear, let the clutch out, and simply hang on. 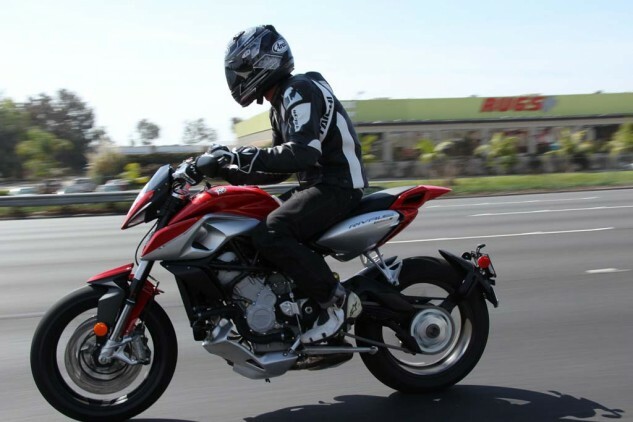 Long, straight freeway stretches can be taxing, as the upright seating position and lack of wind protection turns the rider into a sail at speed. Thankfully, the pegs aren’t placed overtly high, giving adequate legroom for average-sized riders. For starters, the Rivale utilizes MV’s latest fuel map which, simply put, is fantastic. The weight of this comment should mean something if you’ve been paying even the slightest bit of attention to the motorcycle press lately. If so, then you’re well aware of the vitriol spewed in Varese’s direction in response to the company’s fuel injection mapping. Well, folks, it’s fixed, and we’re all the better for it. With proper fueling, the 798cc Triple can flex its nearly 123 horses (as tested during our Super Middleweight Sportbike shootout) the way MV intended. Power delivery is predictable, and the rush of power, as one would expect, hits way harder than a 600 but doesn’t overwhelm like a literbike. Equipped with the same MVICS electronics suite as the F3 800 and Brutale 800, the Rivale lets you choose between four ride modes (Sport, Normal, Rain, Custom), eight traction control settings (nine including off), and even the level of engine braking. ABS isn’t available yet, but will be soon. 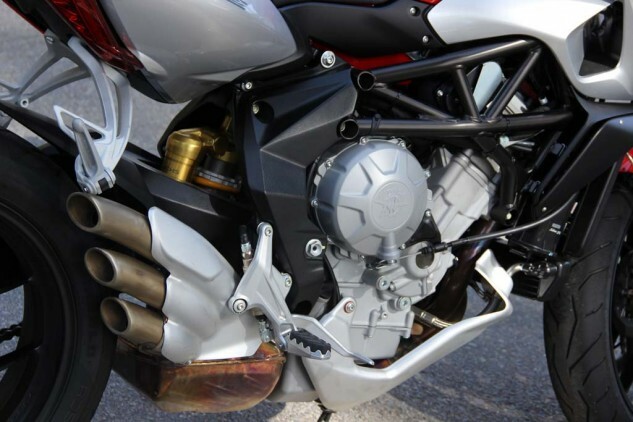 It’s a joyous occasion to ride a late model MV Agusta with sorted fuel injection mapping. Now its proper performance measures up with its stunning looks. Throttle reaction feels best in Normal mode, as the Sport setting is too aggressive for my tastes. Short gearing lets the bike leap off the line, and the quick-shifter (Electronic Assist Shift in MV parlance) is calibrated well for street use, allowing for quick, crisp upshifts without touching the clutch lever or blipping the throttle – the best MV quickshifter we’ve sampled. In the twisties, the Marzocchi fork and Sachs shock work well enough, absorbing road imperfections and reacting to changes well. The bars, too, give good leverage to throw the bike into corners. 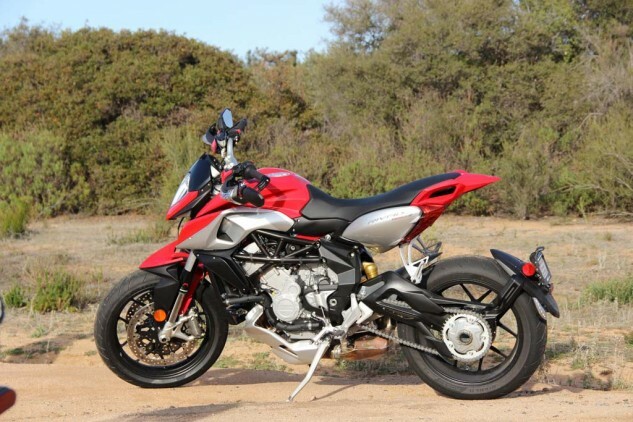 However, a slightly longer wheelbase compared to the F3 800 and Brutale 800 (55.5 in. vs. 54.3 in.) means the Rivale isn’t quite as quick to turn in. Don’t be confused, though: as the Rivale is more than ready to cut a good clip. The Rivale boasts a new gauge cluster that addresses some issues we had with the instrumentation on the Brutale and F3. Road speed and the large gear indicator now reside at the top of the display, making them the first thing you see at a quick glance. It’s relatively easy to navigate, though those with large digits may have some trouble toggling through the small buttons with gloves on. Other Rivale niceties include passenger grab handles that are nicely integrated into the bodywork. And considering the bike’s sporty and rebellious nature, its seating position is quite comfortable. Tall-ish bars put the rider upright, while the pegs aren’t terribly high, giving ample legroom without once dragging pegs. The Rivale’s handling may not be as responsive as its F3 800 and Brutale 800 brothers, but it’s still plenty capable. Like any motorcycle, and especially MVs, the Rivale is not without its faults. Chief among them is its incredibly short range. Purportedly carrying 3.4 gallons of fuel on board, the Rivale won’t go far before it needs more dead dinosaurs. In fact, the low-fuel light would routinely illuminate at 70 miles, with about a gallon of gas left. On one occasion, the light came on at 56 miles! The Rivale averaged 31 mpg in our hands, so you’ll be lucky to go 100 miles on a tank; impossible if you intend to actually ride the bike in a manner that would make the ghost of Claudio Castiglioni proud. As just mentioned, the seating position is relatively comfortable, but without any wind protection, freeway riding transforms the rider into a sail at speed. Further compromising comfort are the hard edges of its saddle, making long stints a little punishing. Luckily, with such short range, there will be plenty of opportunities to hop off and stretch during refueling. The Rivale’s wingspan is enormous with both mirrors extended! While the folding mirrors look trick, the novelty fades the moment you filter through traffic. On a side note, the turn indicators are integrated nicely into the hand guards. 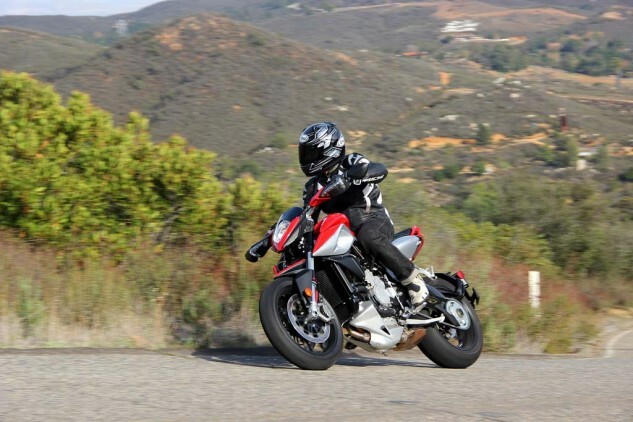 It’s hard to fault the Brembo brakes on the Rivale, but just as we experienced on the F3 800 during our Super Middleweight Sportbike shootout, the pad compound seems a bit aggressive for street use. Lastly, I’ll admit the fold-out mirrors are pretty stylish, but they cause the bike to become extremely wide – a rather significant setback if lane splitting is legal where you live. Sure you can fold the mirrors in, but they don’t return to their previous setting when popped back out. It doesn’t take long before constantly having to adjust mirrors becomes annoying. So where does this place the $14,998 MV Agusta Rivale? If you’re lucky enough to have canyon roads (and a gas station!) just outside your front door, the last few paragraphs will mean nothing to you. For the rest of us, you’ll likely develop a love/hate relationship with the Rivale, as I have. If you’re anything like me, you’ll go through your list of curse words on the way to your favorite riding road, only to replace those emotions of anger with howls of excitement as, in that moment, the Rivale will leave you with an ear-to-ear grin. Of course, one can’t end a review of the MV Agusta Rivale without mention of a certain other Italian brand which arguably started the street-motard-on-steroids trend. Indeed, the bike in question is Ducati’s Hypermotard. In this class of two, clearly a showdown is in order. Stay tuned, as that’s exactly what we have coming. From any angle, the MV Agusta Rivale is a gorgeous motorcycle with great performance. 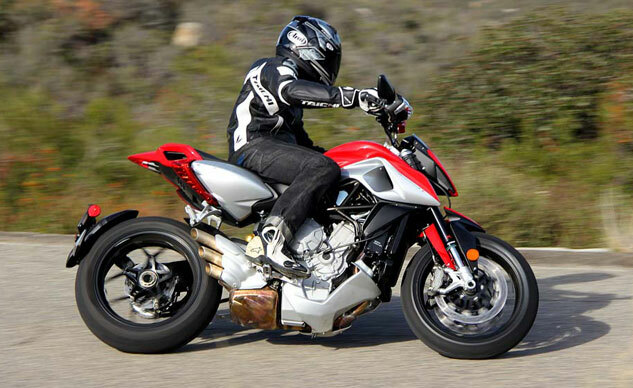 The question now is: how will it fare against its cross-town rival, the Ducati Hypermotard SP?